Work it! Missy Elliott hit up the 2014 Soul Train Awards in Las Vegas on Friday, Nov. 7, wowing the crowd when she reunited with Lil&apos; Kim and Da Brat to sing their 1996 platinum single "Ladies Night" as a tribute to Kool & the Gang. Even in a baggy bejeweled hood and leather pants, the legendary emcee, 43, was able to show off her 30-pound weight looks, looking fit and trim. "Didn’t lose 70 pounds. That was during my &apos;Under Construction&apos; album," Elliott tweeted in October of her extreme weight loss around the time of her 2002 record. "This time I lost 30 eating healthy/work out to @ShaunTFitness T25 videos. I do the Insanity workout. Sweets/bread/ fried foods is my weakness. 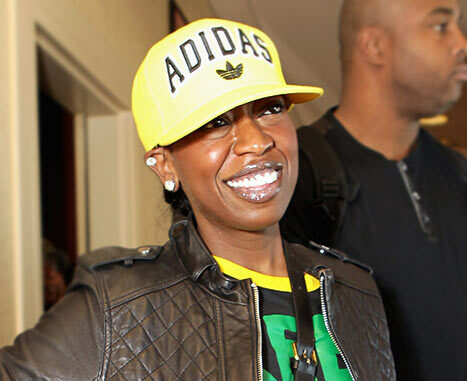 It’s not easy but health comes 1st :)"
Tell Us: What do you think of Missy Elliott&apos;s Soul Train Awards look?